These powerful Fuji 2'' Angle Grinders are designed with a gear reduction mechanism and speed control governor to maintain the power and rotational speed. The light weight and compact design on Fuji 2'' Angle Grinders make them excellent for polishing, grinding, paint removal and can be used with non-woven cloth, brushes, flap wheels and buffs. The 5412052253 Fuji NPT 2'' Angle Grinder, Collet Model is one of thousands of quality tooling products available from MRO Tools. 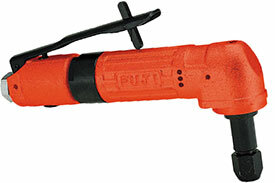 Please browse Fuji 2'' Angle Grinders for tools similar to the 5412052253 Fuji NPT 2'' Angle Grinder, Collet Model. 5412052253 Fuji NPT 2'' Angle Grinder, Collet Model description summary: Model: FA-2C-2BF (NPT) Collet Size: 6mm Free Speed: 15,000 min¹ Power: 265(W)/0.36 (hp) Spindle: 3/8-24UNF Overall Length: 197mm/7.80'' Weight: 1.5lb Max Air Consumption: 0.4m³/min / 14.12ft³/min Air Hose Size: 9.5mm/ 3/8'' Quantity discounts may be available for the 5412052253 Fuji NPT 2'' Angle Grinder, Collet Model. Please contact MRO Tools for details.